Present: Shri M. Venkata Krishna Reddy, M.A., B.Ed. 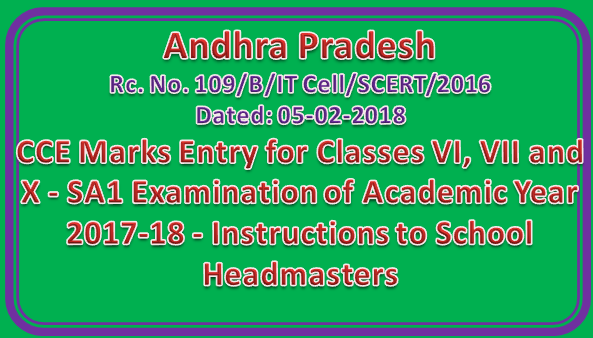 Sub: School Education - CCE Marks Entry for Classes VI, VII and X - SA1 Examination of Academic Year 2017-18 - Instructions to School Headmasters - Reg. schools. Marks entry through APOnline franchises is not available this academic year. b. As per the guidelines on implementation of CCE issued by CSE, the responsibility of ensuring timely entry of marks is entrusted to the headmasters. c. Headmasters are requested to first complete any pending language mapping of students on the portal before proceeding to marks entry. d. The last date of data entry for SA1 is Thursday, 15th February, 2018. Headmasters are requested to ensure that the marks entry is completed on time. c. Any request for data entry beyond the deadline will not be entertained and will be considered seriously. h. Every registered ticket on marks entry from I leadmasters will be resolved by APOnline within a maximum of 2 working days to enable easy data entry.